Remember, education is often the key to positive change, for yourself, for those around you and for the world. As a graduate of the school, you know well the value of working together and embracing diversity, of backgrounds and of disciplines, to create new ideas and overcome old problems. Take what you’ve learned with you wherever you go...but don’t forget us. We encourage you to stay in touch with the school and your fellow colleagues throughout your career. 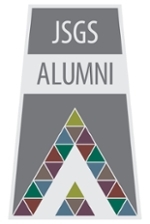 Show your JSGS pride by wearing your alumni pin. To receive your pin, please email jsgs@usask.ca or jsgs@uregina.ca.